The October issue of NARC. magazine is out now, available from over 200 outlets across the North East. We’ve got a packed issue in store for you this month! 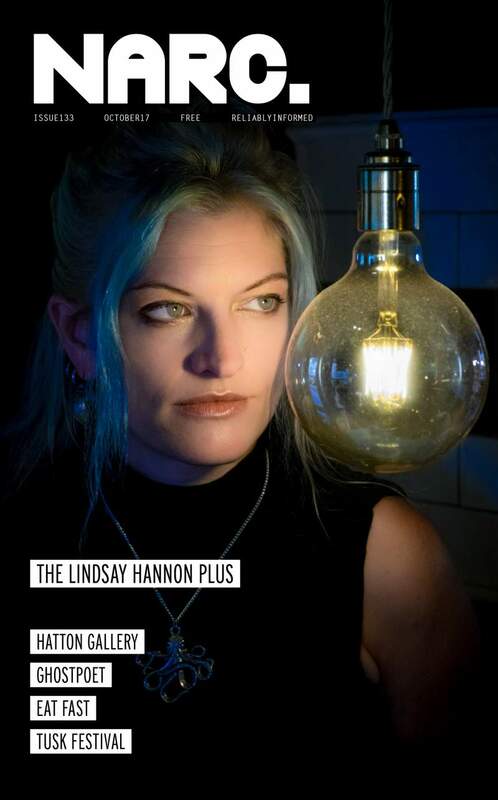 Our cover stars are jazz quartet The Lindsay Hannon Plus. Claire Dupree chats with Lindsay about telling stories, challenging genre boundaries and overcoming preconceptions. Illuminating pics courtesy of Nick Wesson. As always, the news section is chock full of gigs, festivals and releases. Read more about A-Sun Amissa, Desperate Journalist, Donnie Willow, Godspeed You! Black Emperor, Jeffrey Lewis, Liars, The Dears, Hartlepool Folk Festival and much more. The Culture pages are equally as busy, with features on Hatton Gallery’s reopening this month; gender-defying plays at Northern Stage; a stunning exhibition of photography from Sheena Revolta; and Durham Book Festival’s plans to bring top authors and writing projects to the region. You can also find out more about theatre, comedy, art and film from across the North East including The Flickering Darkness exhibition at Abject Gallery; Freedom City events across Newcastle and Gateshead; a revolutionary theatre season at Tyneside Cinema; Bob Dylan’s exhibition at Stockton’s ARC; Sunderland anarcho-punk collective The Bunker’s exhibition at Pop Recs and much more. Interview-wise, Linsey Teggert catches up with the nationally acclaimed Eat Fast ahead of their Halloween show at The Cluny; Mark Corcoran-Lettice finds out more about the powerful electronic folk of Me Lost Me [I Lost My]; Nick Wesson talks to Nine Tons about their latest EP Moldwarp; Louise Henry talks radio, recording and politics with Ghostpoet; Nad Khan asks Joshua Hayward of The Horrors about their latest album ahead of their Newcastle show this month; Linsey Teggert talks to Heather Perkins of riotous London punk trio Slowcoaches; plus there’s features on Middlesbrough’s ‘metropolitan music festival’ Twisterella; and with another weekend of diverse treats in store, Lee Fisher asks Lee Etherington about this year’s TUSK Festival. We review demos by Jennifer Walton, Fake Hippy, Parallax Skies, Lhymes and The Buddha Machine; there’s reviews of new album releases from St Vincent, Circuit des Yeux, The Burning Hell and more, plus track reviews from Lydia Lovelace, Leddie MC, Rubber Bandits and more. Enjoy reports from the front row of Sparks, Warm Digits, John Legend, Home Gathering festival, Pet Shop Boys, Maximo Park, Lindisfarne Festival, Lowkey and many more besides.